The perfect set for inviting and honoring your guides, ancestors and spirits! 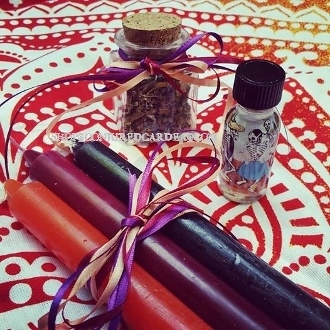 You will receive an ounce of my hand-blended Spirit Guide incense containing home-grown artemisia flowers as well as calendula petals, myrrh resin, copal resin and more. A roll of charcoal is included to get you started! You will also receive three taper candles in maroon, black and orange as well as a 1/2 ounce bottle of my Dia de los Muertos oil created with sunflower, calendula and grapefruit.